Doing a Modern Business the Old-Fashioned Way! A professional sales and service staff with more than 50 years of history. Your reliable, family owned and operated hardware and parts store. New and used steel, hardware and products too numerous to mention! Over 7 acres of steel salvage including a custom metal design showroom. 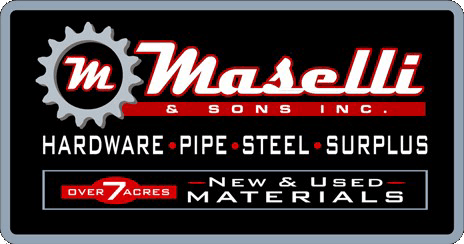 M. Maselli & Sons, Inc. offering quality products at affordable prices, a one-stop-shop. Largest new and used pipe and steel dealer in Northern California, new and used. Proud to partner with The Petaluma Junk Company, best solutions for recycling metals. Create custom-cut gate designs, address signs, ranch signs, logos, name plaques. M. Maselli and Sons Inc.